The song is based on the longing to prolong the joys and delights of a late drinking session and the regrets of having neglected life’s duties, as dawn is breaking. The síbín or hostelry in this song is ruled by the iron fist of a diligent landlady, who only pours on payment. It is one of the most popular drinking songs found throughout the Irish speaking districts of Ireland and is often the last song of the night or early morning at singing sessions throughout the country. There are many versions of the song, with various airs from Coolea in County Cork to Rannafast in County Donegal, which may have its origin in an older song type. This version of the air is unique to the Oriel tradition. Its title alternates between Tá ’na Lá and Níl ’na Lá. Another verse found in the locality suggests that the hero of the song had more on his mind than just late-night drinking. Sínim suas leí go maidin’. and I’ll pay a visit to the landlady. I’ll lie until the morning. This was the last known song to have been heard, sung by one of the last native speakers of south Armagh Irish. In 1942 a census was being made of the last Irish speakers in 1942 (published in An tUltach 20 April 1943) by Pádraig Mac Con Midhe of Carrickasticken ( AHU p377) and Eamonn Devlin of Cullyhanna. They were joined by Pádraigín Ní Uallacháin’s mother, Eithne Devlin from Cullyhanna, who remembered hearing an old Irish speaker called Máire Mhíchil Tharlaigh Ní Chuilleannáin (Mary Michil Tarry Hollywood), sitting on the ditch outside her home on a summer’s evening, on the Carrive side of Glendesha near Mullaghban. When Mary was asked whether she spoke Irish, she replied: ‘Ceolfaidh mé’ (‘I’ll sing’) and launched into Níl ’na Lá. Though the spoken language had virtually died out, songs were still retained in memory. The oral tradition of song in Irish has outlived Irish as a community language in southeast. Glendesha is also the same road where the collector Tomás Mac Cuilleannáin, Tommy Hollywood (AHU pp. 365-6) was born and where he learned his Irish from his grandmother Biddy McConville. Mary Michil Tarry Hollywood, was also a relative of his. Mac Cuilleanáin’s birthplace is marked with an inscribed stone in Irish above a ruined ﬁre hearth carved by a local farmer called Michael McGuigan, who was keen to honour his neighbour Tommy Hollywood , the last speaker of Mullaghban Irish, who was from Carrive townland. The Hollywoods still live in the vicinity. They are remembered in the song Mal Bhán Ní Chuilleannáin (Fair Molly Hollywood) which was set to a very popular tune composed by singer Eithne Ní Uallacháin. Tommy Hollywood, Frank McNeice, Peadar Ó Dubhda and Thomas Traynor – collectors of Oriel folkore. Copyright A Hidden Ulster 2017. 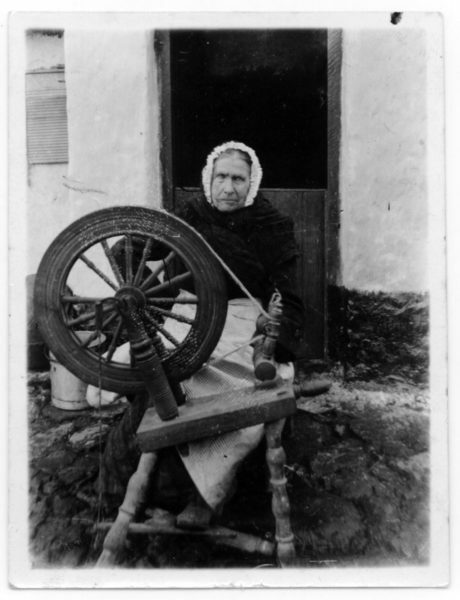 Cití Sheáin Dobbins, a prize spinner, singer and storyteller from the Omeath Gaeltacht, d. 1922. Copyright A Hidden Ulster 2017. 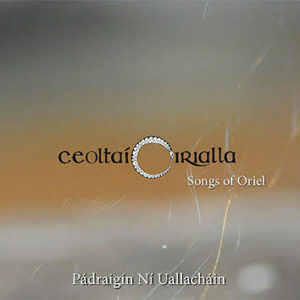 Traditional singer Pádraigín Ní Uallacháin, sourced and reconnected both lyrics and music, and first recorded it on Gael Linn CD, An Dealg Óir 2003. It is recorded on Ceoltaí Oirialla – Songs of Oriel CD 2017. and is now popular again with local traditional singers and farther afield. Tá ’na Lá: Luke Donnellan, Box 1, 3/2. Chan Fheil sé an Lá: Lorcán Ó Muirí MSS (27-8) in Ó hUallacháin papers from Mrs Dobbin, Omeath. Níl sé ’n Lá: Seán Ó hAnnáin MSS, Ó Fiaich Library, Armagh from Brigid Hearty, Lough Ross, 1897. Níl sé ’n Lá: Dundalk Democrat, 24 Oct. 1903, from Mrs Goodman, Donaghmoyne. Agus gheobhaidh tú díolaíocht ar maidin. Anois ar ball a d’éirigh an ghealach. Buail a’ bóthar is ná fan ann. D’iarr mé ar son a phionta leanna. Féadfaidh ’bheith ag ól anseo go maidin. Tá mé féin i dtigh a’ leanna. Agus níl a máthair insa bhaile. Is d’fhág mé séan ar dhaoine eile. Is tráth domhsa bheith ’gabháil abhaile. And you’ll get paid when it is morning. The moon is only after rising. Be off with you and stay no longer. And asked her for a pint of porter. You’ll surely drink in here ’till morning. And I myself am in the alehouse. And their mother isn’t in the house. While bringing joy to other people. It’s time that I was heading home now. Tá ’na Lá: Luke Donnellan, Box 1 3/2. It is transcribed in the handwriting of musician Séamus Ennis. National Folklore Collection by kind permission.